I’ve previewed another three films that will screen at the upcoming San Francisco International Film Festival (for my first set of three, see SFIFF Preview). Curiously, the best two of them, by far, are about the young sons of impoverished, widowed mothers. This is the end of my previews. The next films I see for the Festival I’ll see at the Festival. 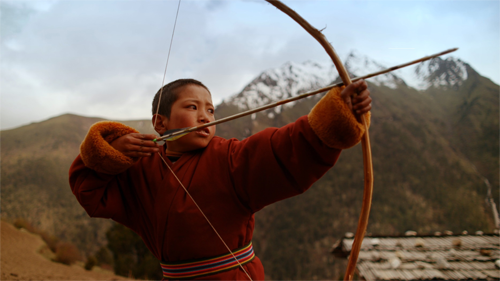 This anthropological documentary puts you into a society you probably don’t know–a remote, mountainous portion of Bhutan–and shows you how it’s changing with the times. And it does this almost entirely through the viewpoint of a young boy. Peyangki wants to go to school, but his widowed mother can’t afford it, and sends him instead to a small nearby monastery–with the intent that he will become a monk. He studies Buddhism, but he also plays, burns excess energy, makes friends, and acts like the utterly adorable child he is. Meanwhile, electricity–and with it TV and the Internet–are coming to town, where they will change everything. Director/photographer Thomas Balmès’ camera makes few obvious comments, and generally sits back and observes a way of life in transition. Touching, visually beautiful, with a slow, stately pace that matches the subject matter. A real gem. Happiness will play at the Kabuki Sunday, April 27 at 12:15 and Wednesday, April 30 at 1:00. It will screen at the Pacific Film Archive Friday, May 2 at 6:30. Ten-year-old Junior (Samuel Lange) bewilders, confuses, and worries his widowed mother (Samantha Castillo). Not only is he mischievous and occasionally thoughtless–hardly surprising for a boy that age. He also hates his curly hair, does everything he can to straighten it, and behaves in ways that don’t measure up to his mother’s ideas about masculinity. Meanwhile, Mom–horrified that she may have a gay son–struggles to get her job back and makes ends meet with little or no money. Both Lange and Castillo give great performances in this unique drama about poverty, race, and homophobia. Bad Hair plays at the Kabuki on Thursday, May 1 at 9:15; at the New People Cinema Sunday, May 4 at 6:15, and the Pacific Film Archive Wednesday, May 7, at 6:30. Meet Ariel (Felipe Dieste) is unquestionably the most boring student radical that ever went on strike–although, to be fair, his comrades in this movie aren’t exactly fascinating, either. In the course of this slow and dull film, he leaves an occupied college to attend his father’s funeral, deals with his father’s estate, joins another group of radicals, goes on a hunger strike with some meat packers, and works as a cowboy because his father owned cows. He also has a disability, which no one ever mentions, even when there are legitimate safety concerns. Unbearably dull, with little to say. If you still want to see it, The Militant plays at the New People Cinema Saturday, April 26; at the Kabuki on Sunday, April 27 at 3:15; and at the Pacific Film Archive Thursday, May 1 at 8:50.